SHR would like to award outstanding student theses at the bachelor- and masterlevel in hydrology in 2017. All bachelor and master students who published their thesis in 2017 and who wrote their thesis at one of SHR’s member organization are welcome to apply before 1st January 2018. The selected candidates will receive a diploma and a stipend of 7 500 kr during the next Hydrologidagarna in spring 2018. As student ask your supervisor for advice/ recommendation or get some inspiration from the previously awarded works in 2016 by Josefin Tidermann (BSc) and Bettina Matti (Matti’s work was even published in a scientific journal some time after she had applied for SHR’s price). More information can be found here. For additional questions please contact info__at__hydrologi.org. Detta inlägg postades i Examensarbete, Hydrologidagarna den november 28, 2017 av Thomas Grabs. For the first time in its history SHR awarded two students for their outstanding Bachelor-/ Master thesis in hydrology. Each student received a stipend of 7 500 kr and was invited to the price ceremony held at the Hydrologidagarna 2017 conference in Gothenburg. An independent jury selected Bettina Matti as winner for the best thesis at the Master level. Her thesis was chosen for being highly relevant, interesting, and very well written. The Jury was also very impressed by the fact that the thesis was published in Journal of Hydrology. Matti’s work (“On the variability of cold region flooding”) exemplifies the complexity of hydrological systems as they interact with landscapes and demonstrates how statistical modelling of extremes can be used to explore the combined impacts of climate and setting. 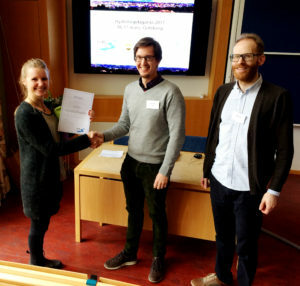 Josefin Tiedermann from Stockholm University (left) receives the diploma for the best Bachelor student thesis from SHR representatives Emil Vikberg and Arvid Bring. The price for the best thesis at the Bachelor level was awarded to Josefin Tiedermann as her thesis (“Brunnsvikens vattendynamik”) presents an impressive amount of very well done field work and analyses, was well written and illustrated and discusses a highly relevant topic. Detta inlägg postades i Examensarbete, Hydrologidagarna och märktes Hydrologidagarna2017 den april 3, 2017 av Thomas Grabs. The Hydrology Days 2017 will take place at the Earth Sciences Centre, Gothenburg University on March 16 & 17. “Urban Hydrology” will be the main topic but other water related contributions are also welcome. Pre‐register for the conference (Support will be provided for the first 10 applicants to submit the pre‐registration). Participate in the conference and present a paper (poster or oral). Detta inlägg postades i Hydrologidagarna och märktes Hydrologidagarna2017 den december 22, 2016 av Thomas Grabs.